The season of entertaining is upon us! 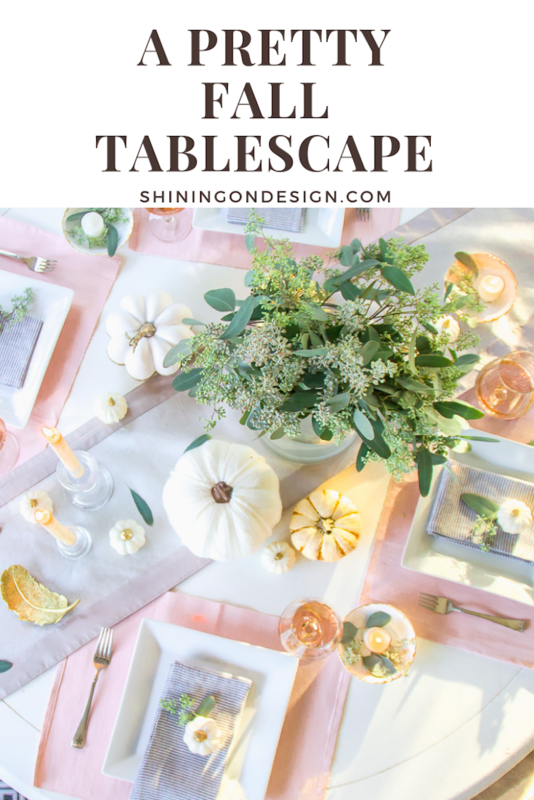 I’ve been looking forward to designing a few tablescapes for the holidays. 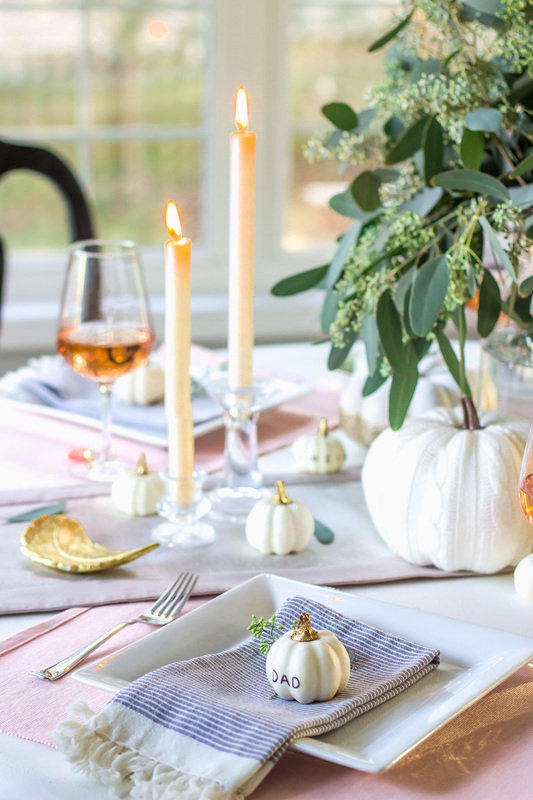 Starting with this pretty fall setting that can be modified to fit any holiday or celebration! You may notice that our dining room may look a bit different. We recently swapped furniture between two rooms ~ in hopes that we will use each room more often. This is my #1 request from clients lately! I also just wallpapered our “old” dining room with a giant floral print. 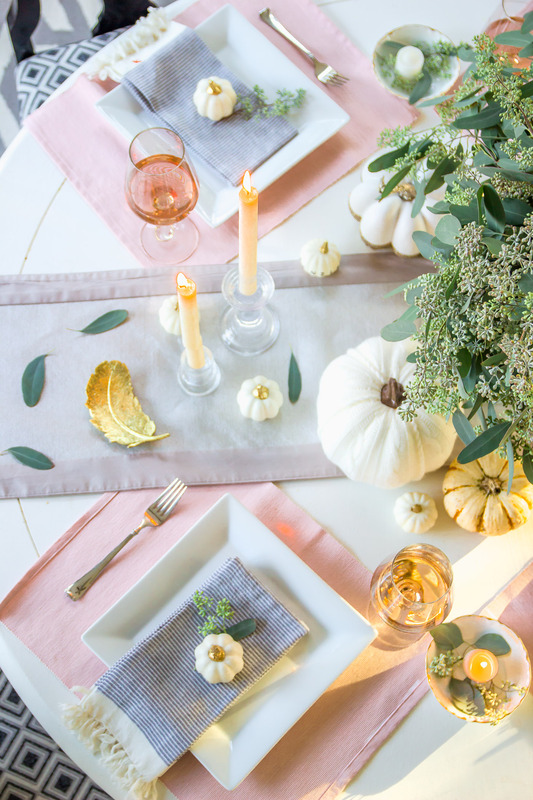 It’s beautiful but doesn’t really jive with a fall tablescape. 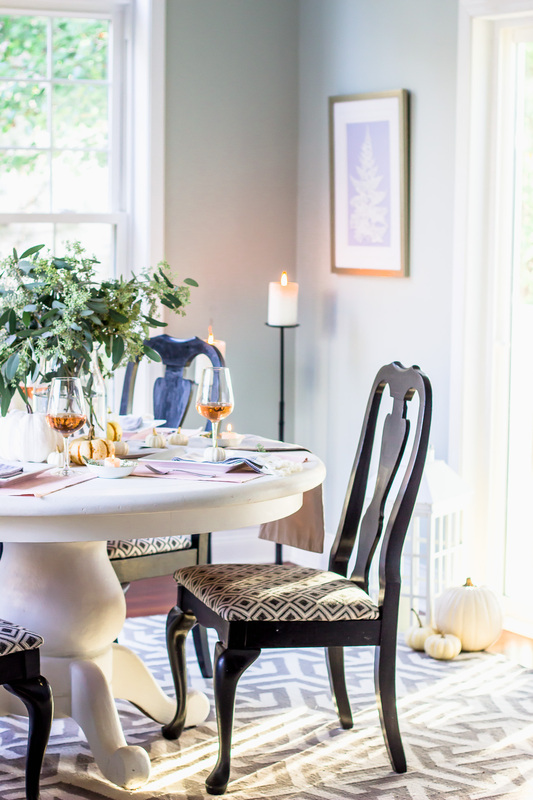 More on the room swaps coming soon… but for now, here are a few steps so you can recreate a simple and easy tablescape at home. And I bet you have most items on hand already! Start by adding a runner. 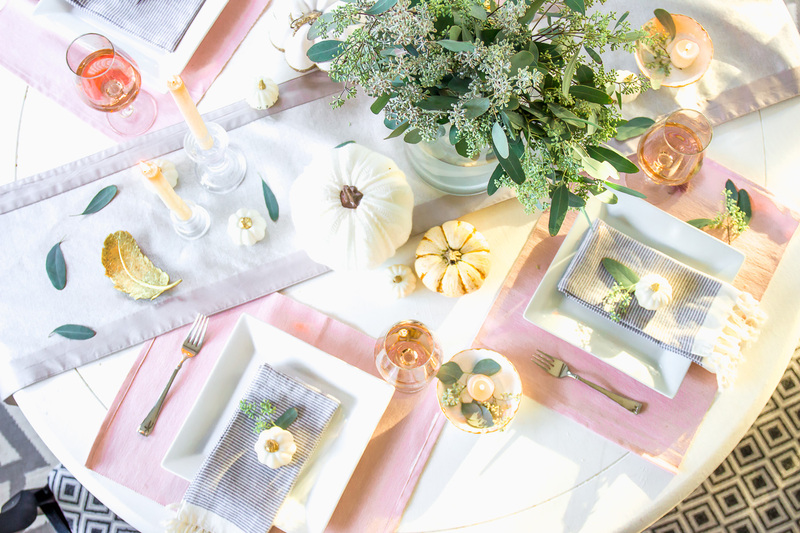 A runner adds texture, color and interest to your table. Plus helps protect your table of course. One tip when purchasing a runner: Think about what colors you have in your dining room or throughout your home. We have grays and silver accents throughout our house and this seems to work for most tablescapes that I’ve done. I use this silver gray one quite often! Add placemats, plates and silverware. 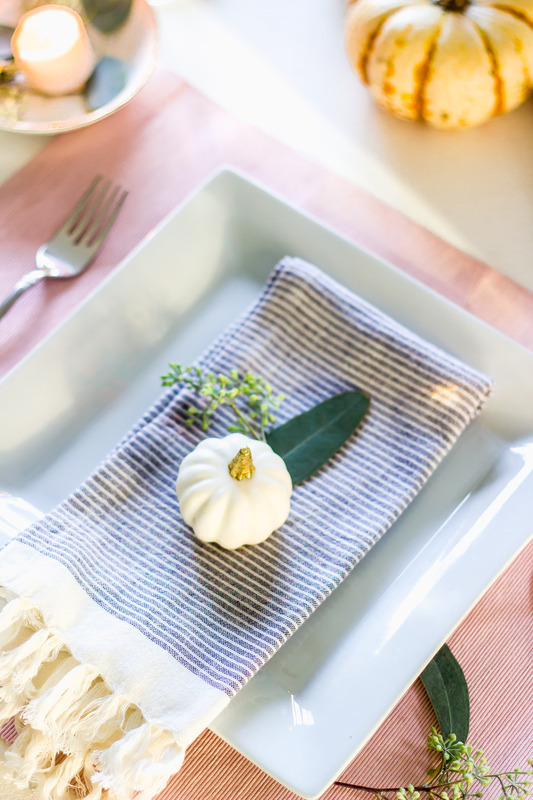 I usually keep my placemats a solid color or simple print when creating tablescapes. I also love our white square plates which are so versatile. They have a modern touch and literally go with every celebration! Napkins are a great way to add interest with pattern. Just like when shopping for a runner, think about what patterns and colors you have throughout your home. This way you will able to use the napkins throughout the year and not just for certain holidays. These napkins go well with our decor. I just love the stripes and fun tassels too! They were gifted to me from Serena and Lily (one of my favorite places to look for home decor inspiration)! I’ve incorporated stripes into a lot of decor over the years and we’ll definitely be getting a lot of use out of these! Bring in the natural elements ~ Choose ONE to make it easy! Next, pick your greenery or flower. 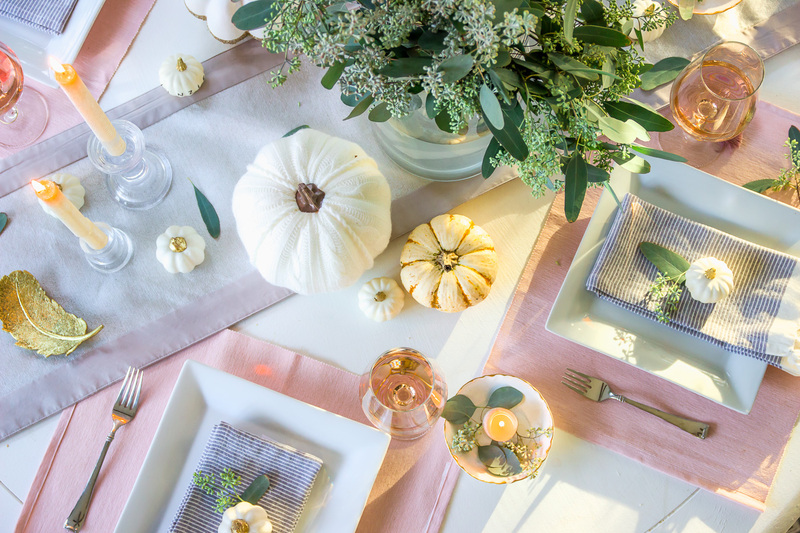 For an easy tablescape, choose one floral or greenery and use it around the table. Here, I picked up my favorite type of eucalyptus and used it in a vase and spread it around the table too. I even added a little to the napkin for a little extra touch. Add a few or a lot depending on what kind of ambience you want to create. Here, I added a couple tapers for height. I also used some smaller candles in little bowls. Then, added some eucalyptus to make it pretty. Lastly, add a seasonal touch! We also added our names to the white faux pumpkins (mostly because the kids love seeing their names written out!). Don’t they make cute place holders too? Kinzie couldn’t wait to start putting her play food on the table! Which brings me to one last tip, make sure there is room for food. The mini pumpkins are easily moved. And food can sit on top of the leaves too. I love your decoration. I have been thinking how to decorate our house this year. My husband and I is putting our Christmas decoration early this year. Thank you for this idea. Thanks Anna! We’ll be setting up our Christmas decor early too! I can’t wait! A lof of great ideas. I always add a runner around the holidays to step my holiday decoration game up. Thanks! A runner is usually a must have for me! Especially since I rarely use tablecloths. And we painted our table so it needs protection. This is so gorgeous!! My dining table needs some love this year. I am debating on getting a complete tablecloth to cover it up so that if I decide to decorate it, the colors will really pop. Right now the table is a bit of an eyesore. 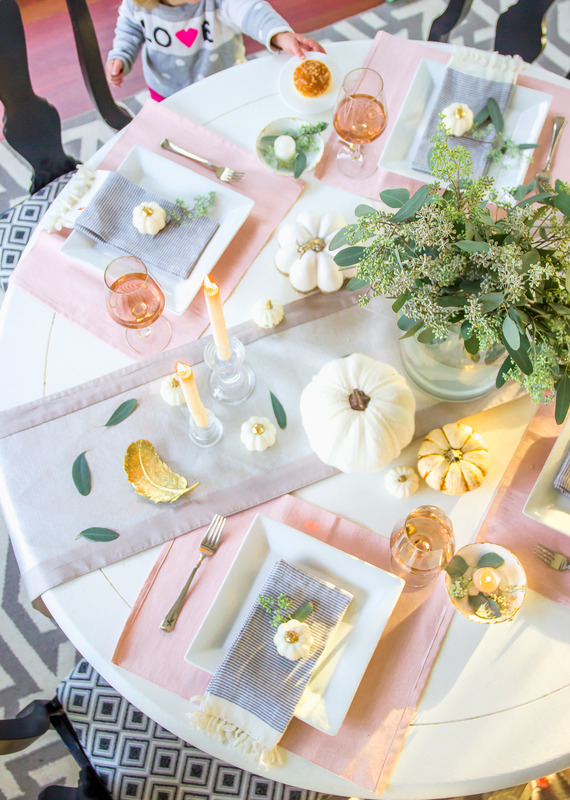 Anyways, I love all the attention to detail this fall tablescape has! Thanks Joanna! A tablecloth is a great idea for a table thats an eye sore!! No one will ever know! 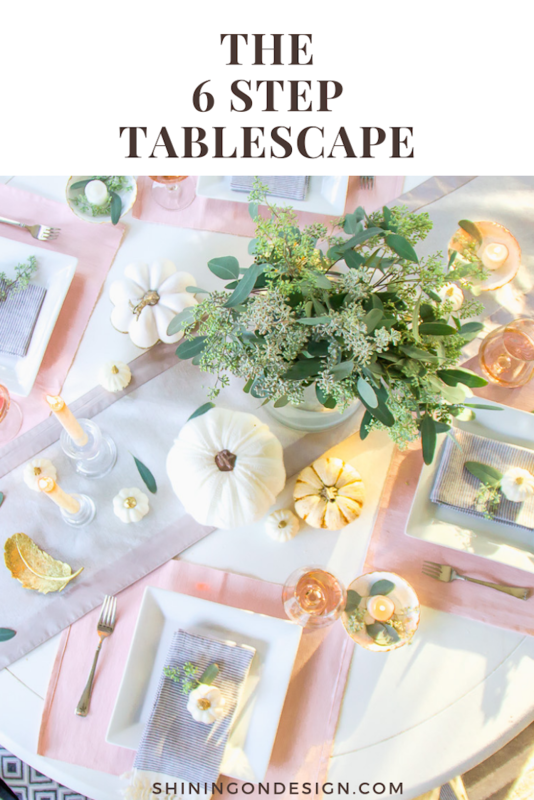 This table scape is absolutely beautiful! so elegant. I love it! i actually have those ceramic pumpkins too! Thanks Christina! Ours are not as nice as ceramic but maybe someday! The setting is absolutely gorgeous. I love the white pumpkins as place markers. I love this table decoration. The colours are perfect, It is actually my style. The tiny white pumpkins… love it. Thanks Cris! I always try to use what we have already and dress it up for the seasons. Those white pumpkins though were my favorite purchase of the year! 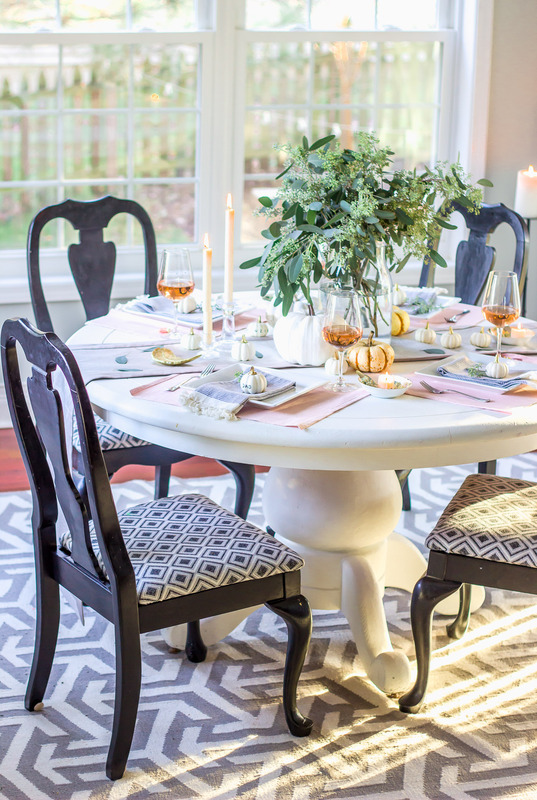 I never thought to use every day linens for Holidays and then just add holiday accents. I’ll keep your advice in mind when I go Christmas shopping! Thanks Candice! I always try to use what we have first, then build from there. 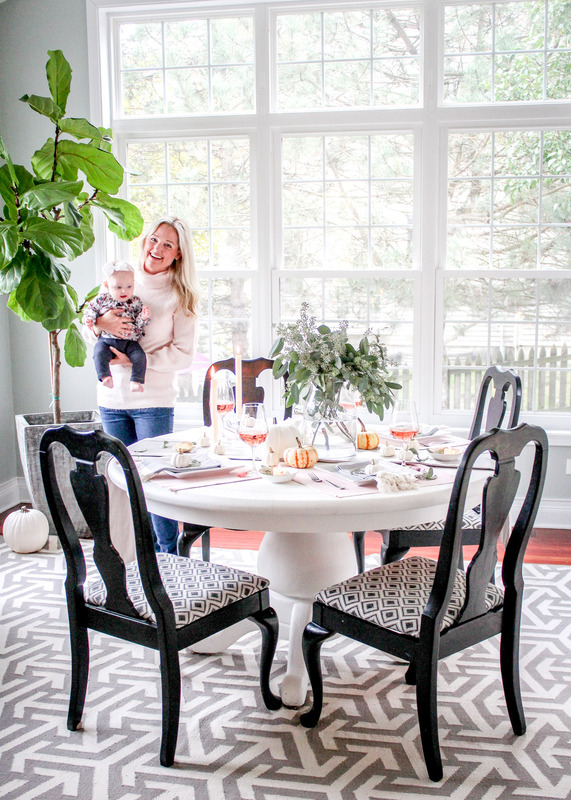 It’s so easy to get carried away with season decor and I really *try* not to! Samantha your table is absolutely gorgeous my friend! I love all the delicate pink and blue shades for fall it makes a very unique and one of kind celebration. Gorgeous, gorgeous, gorgeous! Such simplistic ideas that look absolutely amazing. 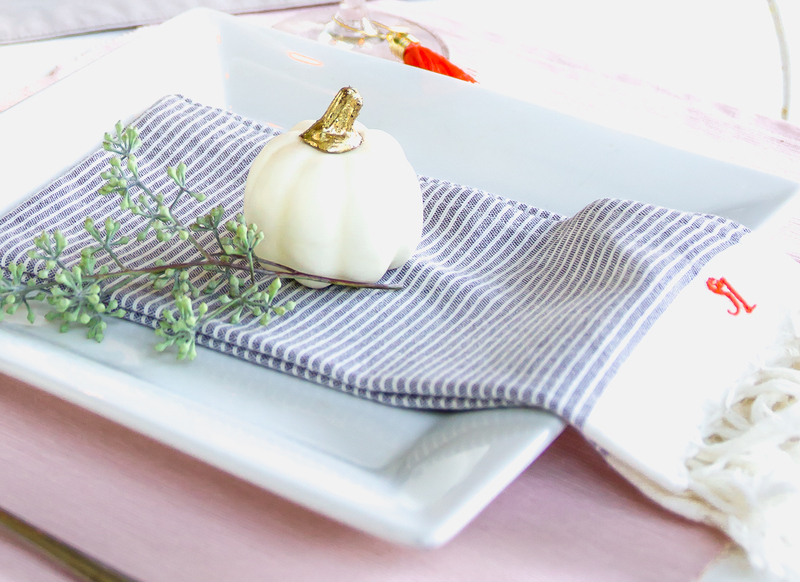 I am going to try the tiny white pumpkin look for this Thanksgiving. Thank you! Thanks Autumn! Those were my favorite purchase this year! Send me a pic of your tablescape ~ I’d love to see! Oh my goodness! This looks amazing! 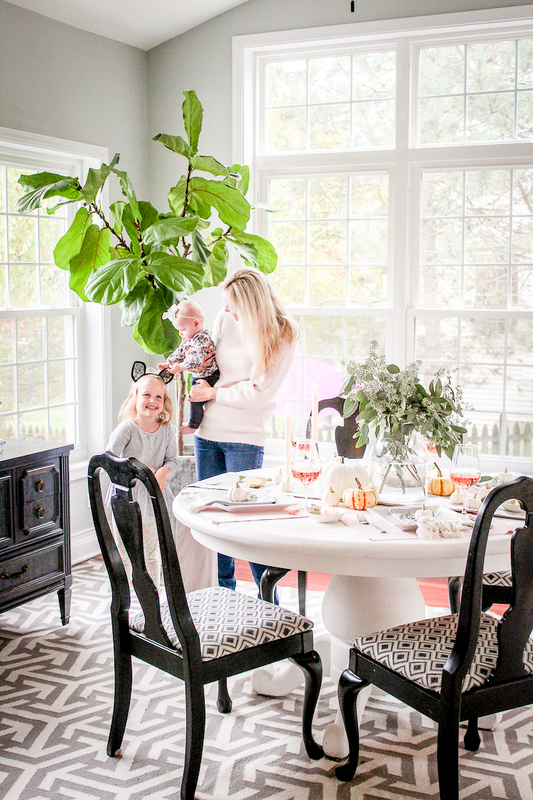 Our table is usually decorated with the food that we tried to feed my kids last meal time. This is serious goals. haha thank you Charlotte! Trust me, this is NOT how our tables usually looks!! Adding the seasonal touch brings it all together. Great tips for me as I begin planning my first get-togethers. Thanks! I like to keep the tablescapes easy. More time to enjoy the food and company!